Product version: v2.0.2, last updated: August 5, 2018. WooCommerce Product Support is a WooCommerce Extensions being developed by Woothemes. 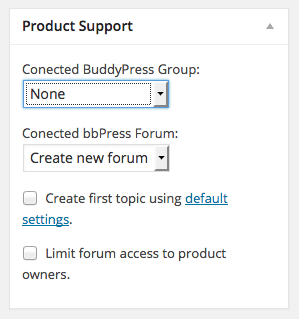 WooCommerce Product Support allows you integrate BuddyPress and bbPress into your woocommerce store and help you automatically create forums for new products, link products to existing forums, and automatically grant users access.